If you’ve ever spilled a full cup of coffee or a soda on your desk covered with paper, then you’ve seen just how quickly paper can be destroyed. 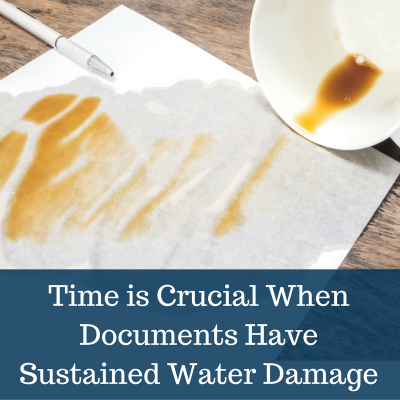 Time is absolutely the biggest factor in being able to save documents after exposure to water. Twenty or thirty years ago it was popular to talk about a paperless society. It didn’t quite happen the way everyone made it sound, did it? Businesses especially still rely heavily on paper documentation. Whether it is regulatory documents or client files, let’s face it – we still rely on paper a lot. Losing important documents to water damage can be devastating. Water damage can be from a flood or from the hoses after a fire – either way water is the absolute nemesis to paper because if exposed long enough, that paper will eventually turn back into pulp. This can be absolutely crippling to an attorney or an accountant who has accumulated volumes of paper documents in his or her building. Bringing in experts in document restoration is absolutely necessary because when it comes to water and paper documents – in order to save and restore them – you have only one shot at getting it right. If this happens in your business the best thing you can do is to get these documents frozen. Place them in freezer bags and place them in a freezer. Freezing wet paper will stop further degradation of the paper and it will allow you time to figure out what to do next. Trying to get reopened for business after water damage can be enough of a headache without trying to take care of damaged paper at the same time. By freezing important documents you can focus on the more critical issues with the peace of mind of knowing that they aren’t going to further deteriorate. You can determine document restoration solutions one you’ve addressed the more crucial elements, like staying in business.